Monday morning passed. It wasn't until Monday afternoon that Roy, Wendy, and Larry were ready to tell the other members of their present family what had happened on their path. “Wait, shouldn't they know about what happened to us, first?! ?” Bowser Jr. exclaimed, pointing to himself and Ludwig. “...Well, you haven't said much so far, so yeah, I follow.” Ludwig muttered. “But we didn't really know where we were going!” Larry chimed in. “IF ONLY YOU HAD A SMARTPHONE!” Bowser Jr. said. Roy picked Bowser Jr. up and threw him into one of Bowser's luggage suitcases. “Hey, Ludwig! You forgot! 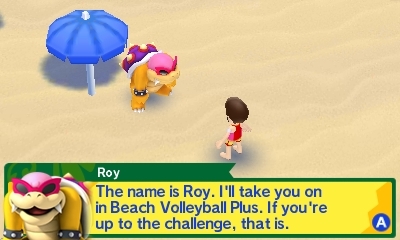 I'm in Team Koopa for a specific sport, Beach Volleyball! So, I challenged people to Beach Volleyball! And wrecked them! Haw haw!” Roy snorted. Beach Volleyball Plus is just Beach Volleyball with some arithmetic involved. Roy is surprisingly still good, even with that. “And while Roy was winning in volleyball, we were supposed to take the human loser's bags and goods!” Wendy said, with a hint of annoyance in her voice. “Well, we didn't find out because SOMEONE was distracted!” Wendy fiercely turned her head towards Larry. “Wot's this about?” Ludwig asked, lifting an eyebrow. “Rosalina's LEGS.” Roy blurted out. “I missed the ball when I saw 'em! ...And then got mad I missed and SMASHED it on my serve!” Roy laughed. “There was this creep taking pictures of her.” Wendy said. Larry pulled some photographs from his shell. Rosalina is on the floor, showing off her...legs. Ludwig was leery of the photograph, but Larry pulled out another and stuffed it in front of Ludwig's face. Rosalina is on one leg, with suspiciously low-resolution feet. Bowser Jr. popped out of the suitcase to stare at Larry's pictures. Roy facepalmed. “Rosalina noticed the boys were all staring at her, and summoned a Luma to beat them all up. It wasn't pretty.” Wendy answered. “In conclusion, you didn't find Team Sonic, and you didn't ask Rosalina about Team Mario's presence, either.” Ludwig spat on the airport floor. “Good, I hated this place.” Ludwig spat again. The Koopalings and Bowser Jr. gathered up their belongings and stuff and followed Bowser's lead. For the rest of the Monday, the Koopas situated themselves in this new space, with the children wondering why they moved. The new space was farther from the shops and airport amenities, but closer to the bathroom. There was a designated man's room, and a female's room. The female's room also had a sign indicating that you could change diapers there. Ludwig wondered if the airport security would check to see if people were the gender they claimed they were. Tuesday was a dull day, as well. Bowser spent most of it trying to communicate to his contacts in Koopa Kingdom, and he barred the children from venturing outside the airport. It turns out they attracted way too much attention from the airport security, along with many other people within the vicinity of the Rio de Janeiro International Airport. Ludwig was happy that they weren't trapped in a quarantine or something. Bowser Jr.'s whining had grown incessant by Wednesday evening. King Bowser had regret bringing the brat to Rio, or at least that's how Ludwig was reading the King's facial expressions. “Daaaadddd! What happened to wondering about the plumbers?” Bowser Jr. whined. “Since you said their gym wasn't there, then they probably aren't around here anymore. They're probably in the Mushroom Kingdom, totally happy and content. Without any Koopas!” Bowser pouted. “You're all gonna LOVE this!” Larry giggled. Is Larry staring at more Rosalina footage? Or is there a legitimate, interesting thing to move the plot along? Find out in PART 4! Here's the source credit for the Roy picture. Is this going to create Larry X Rosalina shipping? If you wanted to find out in Part 4, well, Part 4 is finally here! Seriously, here. Click. Part 5 comes a week after. Rosalina isn't mentioned in it. Part 6 is after that. It's the FINAL part.